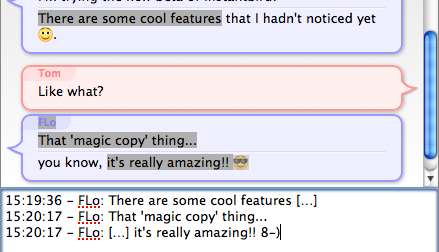 The surprise and enthusiasm of a few people about the “magic copy” feature I mentioned briefly at the end of my previous post introducing time bubbles reminded me that we forgot to introduce this feature when it landed for Instantbird 0.2 as part of our implementation of the Adium message theme system. We decided to use this theme system because it seemed nice overall and was already used by a few other clients as well. However there was something we really didn’t like: using a customized message theme could make copied data from the conversation really hard to read, to the point that it would be unsuitable for sending a quote via email. This is the text we get when copying the selection to the clipboard and pasting it. This is without our “magic copy” feature of course. I should also note that the Bubbles theme used for this screenshot is not the worst in this regards. I’ve seen in the description of some themes (not designed for Instantbird) that they were “clipboard friendly”, which indicates the theme author took this problem into account and probably had to make some trade-offs between the visual appearance and the usability of copied conversations. As we were not satisfied with this situation (which either makes copying from the conversation poorly usable or restricts theme authors’ creativity), we developed a different system that instead of serializing the selected HTML attempts to detect which messages are selected, and to “prettyprint” them based on what Instantbird knows about the message, rather than what is visible and selected. A few technical details: the template used to serialize copied messages is both localizable and customizable from about:config, it’s also possible to completely turn off this feature in case it ever causes some trouble (look for the messenger.conversations.selections. * family of preferences in about:config). 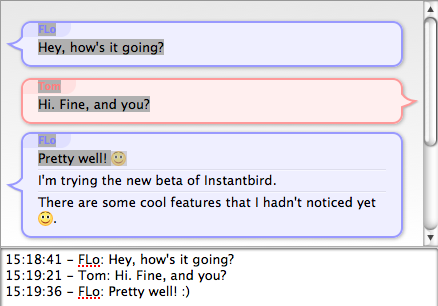 This feature has been turned on by default in Instantbird for over a year and nobody complained about it. 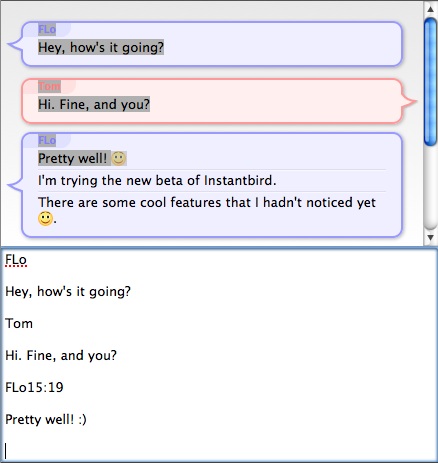 Actually, it’s one of the features that is barely noticed because it just works, but it is something that is really missed if using another IM client after using Instantbird for a while. This entry was posted in Features and tagged adium, user interface by flo. Bookmark the permalink. This is really very impressive stuff. The problem you have addressed here is something that has had me and others struggling in our efforts to neatly organize and share discussions. Really very good work. Thank you. Well done! Just do not have the plug-in Anti-Spam!